In the coming days the world’s two billion Christians will begin celebrating Holy Week. This week, booked-ended by the festive days of Palm Sunday that honors Jesus’ “triumphal entry” into Jerusalem, and Easter Sunday that celebrates Jesus’ resurrection, contains some of the most significant events on the church calendar. Among others, there is Great Wednesday, Good Friday, and Holy Saturday. And depending upon the tradition, Holy Week is celebrated with special Masses, vigils, Tenebraes, participation in the Stations of the Cross, Passion plays, sunrise services, cantatas, and street processions. Not to be missed in all this activity is the Thursday of Holy Week, referred to as Maundy Thursday. “Maundy,” like so many Christian traditions, comes from the Latin word mandatum, meaning “commandment.” On Jesus’ last night before his crucifixion, he gathered his disciples and gave them the commandment to love and serve one another. Then he showed them how. Jesus rolled up his sleeves, threw a towel over his shoulder, and with a basin of water, squatted down to wash the filthy feet of his disciples. Yes, God stooped. The Christ crawled. The Master became the servant. Jesus took the position of a slave and honored those who had not the slightest indication of how holy such an act really was. In the midst of this busy week of festivities, I wonder if a few of we Christians might pause to consider vulnerability as a holy exercise. See, Jesus never maintained feelings of superiority over others; he eagerly gave up his rights and privileges. Jesus didn’t defend himself with angry tirades or theological manifestos; he taught – and manifested – vulnerable love. Jesus’ instruction on Maundy Thursday was not a how-to lecture on proving how “right” his followers were; it was a demonstration course for how to live in the world. Thus, the Christian means and method of confrontation is not condemnation, but naked service. 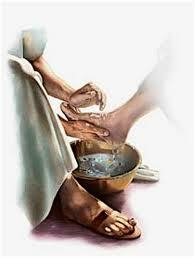 A follower of Jesus testifies to and celebrates the truth he has come to know, but knows in equal measure that the truth has been washed through and through with a foot wash basin. The power of the disciple of Christ is a power wielded, not by force or fist, but by a holy hand towel. He who would be like Jesus does not lord over others. He gets down on the ground, down on his face, down in the dust, the mire, and the mud. He makes himself completely and totally exposed. Even if those whom he serves kick him in the face; even if they stone him to death; even if they crucify him on a cross: There is no other way. So how does this kind of vulnerability break out in our lives? Maybe like this: One day, all at once or like a slow dawn; in a blinding flash or a gradual evolvement; as literal as the world or as mystical as a dream; we will see Jesus kneeling before us. His calloused carpenter’s hands are gently splashing the water in the basin. A clean towel hangs around his neck. He crouches to wash our dirty feet, knowing who and what we are really made of: Suspicious, angry, petty, fragile, hateful, self-centered, and untrusting. We know he knows these things, but then he smiles a knowing smile, and we understand that he loves us anyway. By submitted to and serving us, Christ opens our hearts in new, revolutionary ways. And the more open our hearts become – the more we understand how vulnerable our Lord has made himself to us – the greater our capacity to be vulnerable toward others. That’s how God’s love works, and that love can make any week holy.